The nervous system is a complex network of nerves and cells that carry messages to and from the brain and spinal cord to various parts of the body. It allows us to process information from the outside world and keeps our bodies safe from harm. In animals, the nervous system is made up of two main parts: the central nervous system (CNS) and the peripheral nervous system (PNS). The central nervous system consists of the brain and spinal cord while the peripheral system is made up of nerves that control different parts of the body. Both the CNS and PNS work by transmitting signals to each other which allows them to speak and exchange information. For example, if you want to move your left leg, your brain sends a signal that travels down your spinal cord. It then reaches the nerve that controls your left leg and allows it to move or change positions. But the nervous system also works in the opposite direction. Putting your hand on a hot stove agitates the nerves in your hand causing electrical signals to travel up towards the brain. This signal gets interpreted by the brain as ‘pain’ causing you to quickly remove your hand from the stove. In this way, the nervous system has received information from your environment which allowed you to yank your hand away. These two systems work in perfect harmony to let your body move, eat, breath, and stay safe. even the amount of stress you feel. 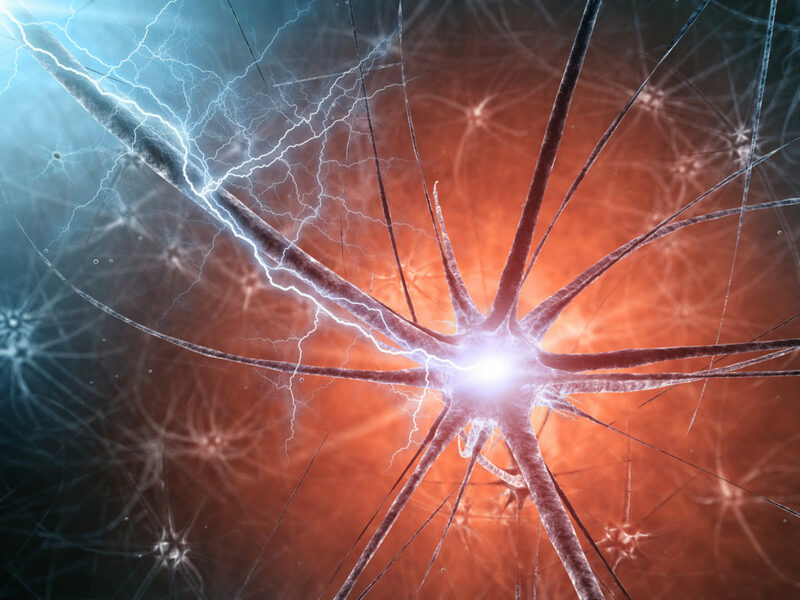 What does the nervous system need to function? The nervous system doesn’t need much to function since it is always quietly working in the background. But anything that keeps the brain active, the body healthy, and mind busy is always good. The general rules of healthy living also apply here. Eating a well-balanced, low-fat diet with ample sources of vitamins B6, B12, and folate will help protect the nervous system2. Make sure that your diet contains lots of fresh fruits, vegetables, and whole grains. Additionally, regular exercise and giving up smoking are steps you can take to keep your nervous system ticking. Because the nervous system is at the center of our ability to function, if any part of the nervous system stops working, then we’re in trouble. For example, diseases like Parkinsons’ or Alzheimer’s fundamentally change the way the brain works. Both diseases attack different parts of the brain and can lead to symptoms like speech difficulty, memory loss, or a change in personality. Meanwhile, other complications of the nervous system can stop the nerves in our body from working. Nerves in our arms and legs let us move them around freely. They also allow us to feel things like temperature, texture (soft versus rough), and pain. When conditions like multiple sclerosis or even the late stages of diabetes occur, these abilities are all affected. There are thousands of illnesses that can change the way the nervous system works. An illness that targets the nervous system can affect the way our heart beats, fail to regulate our temperature or let our blood pressure shoot up. But it can also affect complex things like the ability to be conscious, to have thoughts, memories, and language. Our nervous system usually goes under appreciated because it essentially does everything for us without us even realizing it. Some of the steps above can be used to keep our nervous system happy and healthy. It scared me to know that problems with the nervous system can cause huge troubles overall. Like you said, the nervous system is at the center of our ability to function, so it’s like our central processing unit. My mom has been complaining about a feeling of needles poking her hands and feet. That might become a problem in the long run. I’ll go bring her to the specialist ASAP. Thanks!